Easy Loaded Leftover Mashed Potato Soup is a delicious way to use up mashed potatoes from Christmas or Thanksgiving – stovetop or slow cooker recipes included! With Thanksgiving coming up, it’s time to start thinking of ways to use up all those leftovers. We always have a lot of meat leftover, but somehow it seems like our mashed potatoes have a mind of their own and reproduce like a ton of bunnies. Seriously- how is it we always end up with a metric ton of spuds? 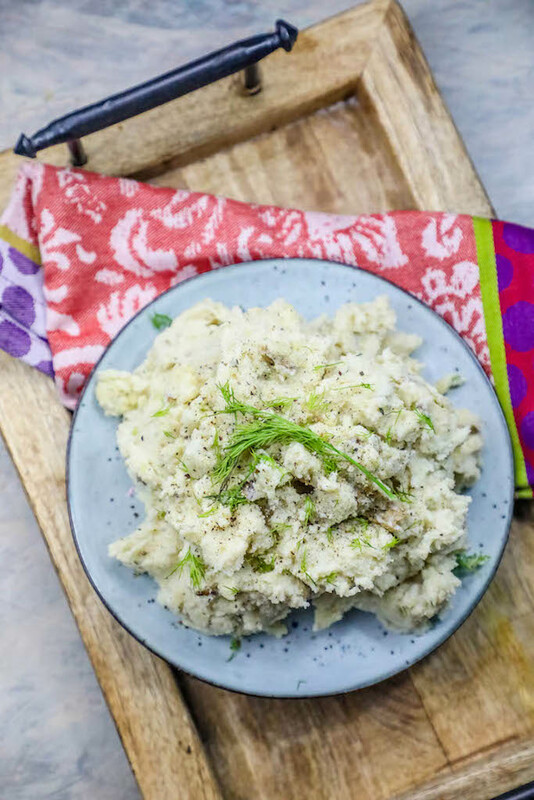 We make SO many, and have SO many mashed potato leftovers – I needed to come up with a delicious recipe to use up mashed potatoes. 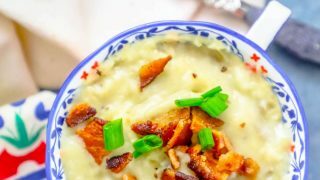 There’s only so many times you can eat the same thing- so this Easy Slow Cooker Leftover Mashed Potato Soup recipe is one of my favorite ways to make a new meal out of leftover mashed potatoes. Just Take Me To The Best Leftover Mashed Potato Soup Recipe Already! If you’d like to skip my tips and tricks and similar recipe ideas and get straight to the leftover mashed potato soup recipe, please scroll to the bottom of the page just above the comments. 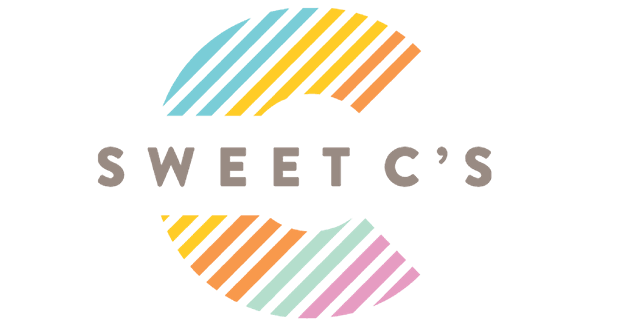 I get a lot of comments and questions in my posts and I try to provide the most information possible for readers! This recipe is so great because there is virtually no prep and doesn’t involve any fancy equipment- making this a great hearty soup you can make without feeling drained the day after a big meal. I just toss everything in the slow cooker and then use an immersion blender to smooth the soup out when it is ready to serve, if needed (which is rare, I like chunks of potatoes in my soup). If you’d like an extra smooth mashed potato soup, you can toss it in a blender – and with some blenders, you can just keep whirring it until piping hot. Who wants to slave away in the kitchen after all the work of Thanksgiving? Not me! This is a super easy soup that will keep you out of the kitchen, but give you something hearty and warm to share with your family. If you try this recipe and like it- and want to try a variation- try cream of mushroom soup or cream of chicken soup instead of the cream! -If soup is too thick, add in more heavy cream or whole milk. -Add more flavor with bacon crumbles or up to 1/2 cup of grated parmesan cheese. -Add garlic powder for a savory kick nobody can resist. -Lay out toppings – like shredded turkey, crispy bacon bits, flash fried onions, fritos, chives, or shredded cheddar cheese to top soup with. You would also sub out some broth and add more mashed potatoes if you’d like a soup that isnt as thick. Or add in some carrots and celery and then blend the soup before serving to sneak in some veggies! If you love this easy one pot potato soup, please check out some of my other deliciously easy one pot soup recipes! 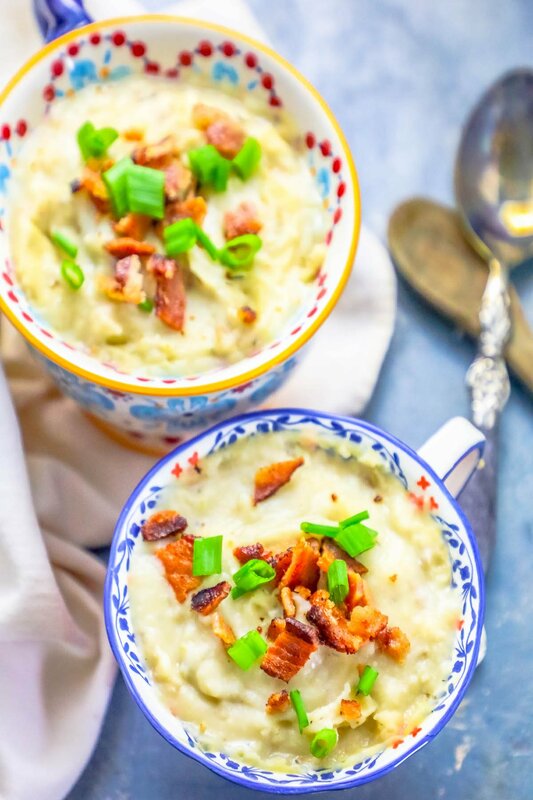 If you love this leftover mashed potato soup recipe, please be sure to check out some of my other favorite potato recipes! 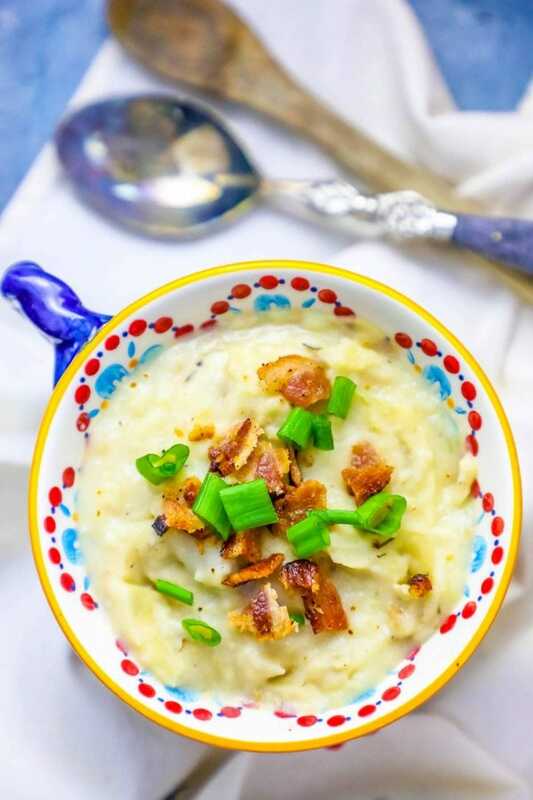 And, for the easiest Mashed Potatoes ever- check out my Slow Cooker Mashed Potatoes! This soup is even tastier topped with chives, cilantro or TONS of crumbled bacon. 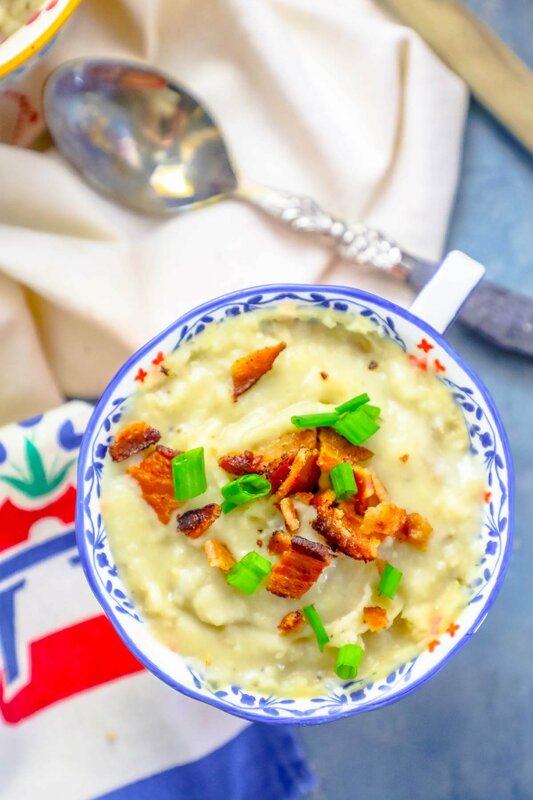 You can never have too much bacon with potato soup, can you? 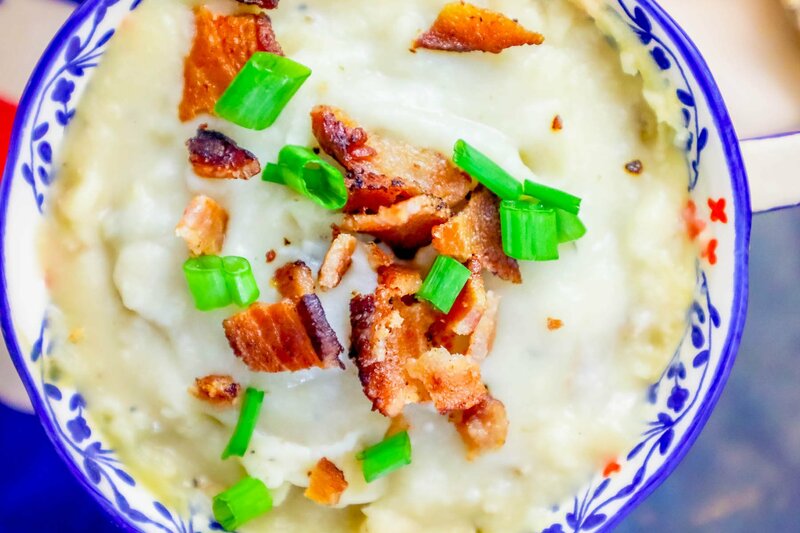 If you love this easy loaded leftover mashed potato soup recipe, please give this recipe a five star review and help me share on facebook and pinterest! 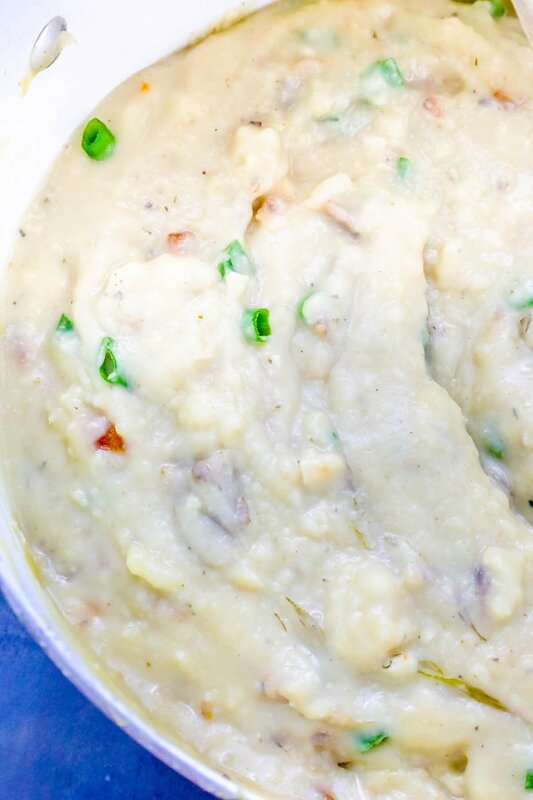 Easy Loaded Leftover Mashed Potato Soup is a delicious way to use up mashed potatoes from Christmas or Thanksgiving - stovetop or slow cooker recipes included! Add butter to stock pot and heat on medium high until melted and foamy. Add garlic to pan, sautee until lightly browned. Add in potatoes, stock, cream, mix well and bring to a boil. If needed/desired, use an immersion blender or pour into a blender to make a smooth, even consistency. Spoon into bowls and top with chives, green onion, and crumbled bacon. Lightly brown butter and garlic in a small pan - cook on medium heat for about 2 minutes, stirring to prevent burning. Remove butter and lightly browned garlic and add to slow cooker. Add mashed potatoes, cream, and stock to slow cooker. Stir well and cook on high for 2 hours. Before serving, use an immersion blender to make more smooth. You can also pour soup into a blender if needed. 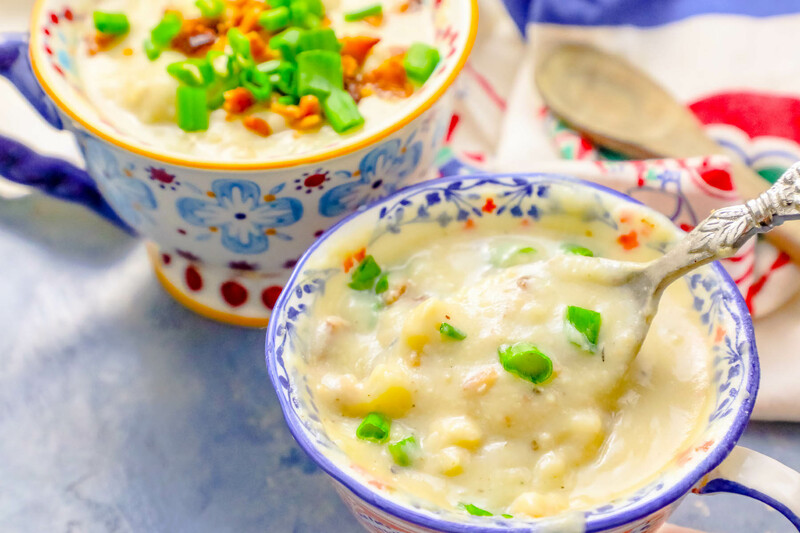 Serve with bacon, chives and any other favorite potato soup topping! Yummy! This looks delicious. I love soup and mash potatoes. I sometimes pour chicken noodle soup over left over potatoes and mix it up and eat, yum. Pinning to my soup board to try. Thanks for sharing! I just found a reason to purposely make too many mashed potatoes for Thanksgiving. I love potatoes, in any form, but soup is one of my favorites. This looks so good! Thanks for the amazing tip. Would it work the same with any kind of potato? IT would Jennifer! Depending on the potato, you may have to add more water or drain off excess, but that’s not a big deal. I’ve tested it a few times with red potatoes because they cook faster and I like the taste, but any potato would work. Basically, you only want like a tablespoon of water or so left when you go to mash them (cause otherwise it will be watery- ick! or not enough water will burn them). So just keep an eye on the water and all will be fine!